Gorgeous variant paper giclee art print from Star Wars! A limited edition of 83 pieces! Celebrate the 30th anniversary of the Battle of Endor! 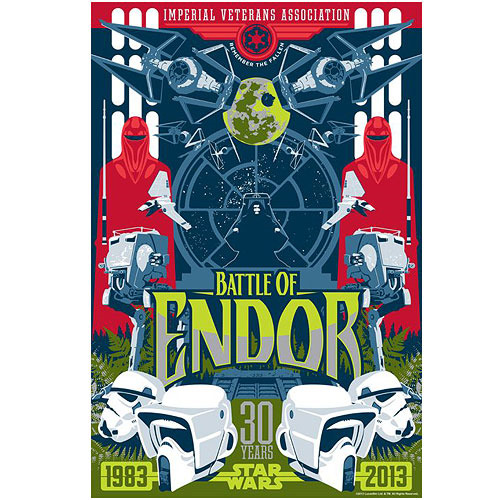 This Star Wars Battle of Endor Variant Paper Giclee Art Print is a gorgeous reminder brought to you by the Imperial Veterans Association, who want you to Remember the Fallen. Featuring a busy picture involving a large amount of Imperial images and symbols, including the Emperor sitting on his Throne inside of the Death Star, a couple of TIE Fighters, some TIE Interceptors, Imperial Shuttles, AT-ST Walkers, Royal Guards, Stormtrooper Helmets, Scout Trooper Helmets, and the Empire's base on Endor. A limited edition of 83 pieces, this gorgeous variant piece of artwork has been printed on paper and measures 19-inches tall x 13-inches wide, with a cool blue tint to things for added effect.